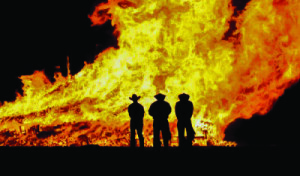 Tarleton State University’s bonfire is one of the oldest events during homecoming and the most expensive. This year’s bonfire will cost students $24,000 just for the pallets burned, while lighting and other supplies will cost $5,000, totaling at $29,000. This tradition has been alive since the early 1920s and had its claim to fame in 1939, when L.V. Risinger took down the airplane flown by Tarleton’s rivals, NTAC (which is now University of Texas Arlington). Traditions keep growing as the campus does, which means students are paying for more. The bonfire was much cheaper in 2013 at $5,182.79, when the pallets were donated, but in recent years the Plowboys lost their donation sources. Since 2014, the Plowboys rely on a company, Texas Pallet, in Balch Springs, Texas to provide and deliver the pallets to the college farm. Dr. Mike Leese, head of the homecoming committee and Associate Vice President of Student Life, said that the it is safer and easier to have pallets delivered than for the Plowboys drive around and pick them. The Plowboys are in charge of building and organizing the L.V. Risinger Bonfire for Homecoming Week every year. Another rising homecoming cost is Midnight Breakfast. This year, it will cost $25,400 with $5,000 of that sponsored by Pepsi. In 2012, Midnight Breakfast cost $13,661.28. From 2012 to 2015, Midnight Breakfast increased five percent each year, but student population only increased approximately two to three percent each year. However, the food costs from Sodexo have increased, causing the cost of Midnight Breakfast to rise. “The cost of the Midnight Breakfast is paid by Residential Living & Learning, since most students who go to the breakfast live on-campus,” said Leese. Students used to pay for Purple Out Picnic, but now it is part of a meal plan. Students with meal plans swipe their cards, and other students are admitted for free. This year’s Yell Contest will cost $5,000 for lighting and sound equipment. Yell Contest expenses increased from $830 in 2013, due to adding extra microphones to the floor so the competition could be broadcast in the smaller gym. Expenses for Yell Contest come out of the university service fees that students pay. The safety of the bonfire is also a concern. There was a student burned at the bonfire two years ago. In response, criteria about using white chalk to line the barrier between the bonfire and the students and the distance the students have to be from the bonfire has changed. The measures of last year’s bonfire and the safety of students are what influence the policies and procedures that were drawn up. 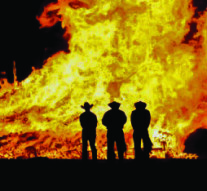 “The size [of the bonfire] is controlled and allowed to be 75 feet in diameter. I think it’s a miss number to say that each year it’s bigger and better, because it’s not,” Leese added. There will also be increased safety measures for travel to and from the bonfire. “There are always concerns with traffic and parking. We are going to use the four shuttle buses this year, and we hope students use them and that will help to discourage drinking and driving,” said Leese. I hope that fire is providing a good education for the money it’s costing. Oh, it is, last year I learned about a rattlesnake!